Blinkyboy, is there any possibility, that we can pay you some money, that you work again at neodex and fix some stuff? or something like that? Mastah blink boy, I have a question. In your tutorial, you use TCB as rotation and move controller, but on root bone you use Bezier so you can use curve editor.. So, is it fine if I use Bezier for my IK manipulator? It looks fine so far on Magos. What make TCB better than Bezier (for warcraft)? found what make it ugly. I scale up the "Body Manip". Before scale it up, they export just fine. Hi, sir BlinkBoy, I wanna know if it is possible to make cloth modifier's animation work when exporting the model :D. I hope you return. what i must do to fix it? Make sure that you paste the neodex scripts in the right folders and then run the script. Even if 1 file is not where the instructions say it won't work. 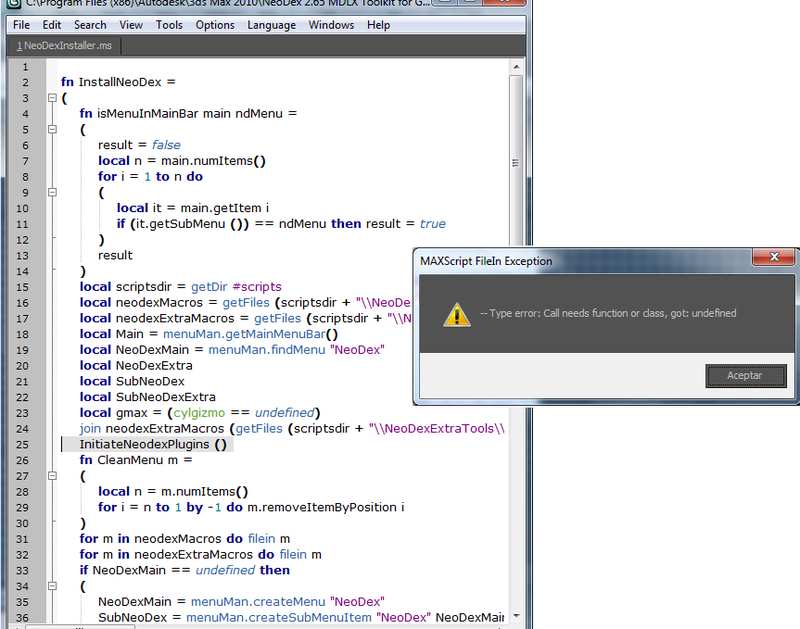 Solved; After renaming the variable I uninstalled and reinstalled the tool and it works! Cannot assign to read-only variable: Dictionary". I think this has something to do with administrative rights or something. I tried renaming the variable to dictionary1 in the scripts that i can find it in but I still go tthe same error and what is unfortunate is that it doesnt show me what exact point in what script the error is occuring. I was thinking could you make an Officer? to match your Skirmisher? Hm, I see. If you are going for extending Assimp, is it going to support exporting from mdx to another file type ? I cross fingers and look forward to it! Any news on the Assimp mdx support ? Ah I see, thank you for pointing there! or aren't interested in reading into it and kinda working on request. Side-note, I saw for Assimp: '3D GameStudio (3DGS) ( .mdl )' and 'Quake I ( .mdl )' as supported file-type. Does this mean I could convert an obj to mdl and that mdl to mdx using the Model Editor ? Or is this mdl another one than the one the WE uses ? Could you provide by any chance a link ? I would like to be independent from Gmax. with only considering vertex coordinates and texture coordinates. Hey, could you please write a small stand-alone script that converts 3ds or obj to mdx or mdl ? Some users and I myself using other modelling tools than Gmax have the odd problem we cannot convert our models to mdx/mdl easily and being dependent on people with Gmax. If you don't have the time or mood for doing so, could you please advice me some threads/information about the mdx and mdl parsing and structure ? American Football, Programming, 3D Animation, Comedies, Dancing, Diving, Art and Drinking ;D.
Advanced Animation Tutorial! check out my: Happy Animating with IK!